Psst: The blog returns next week! The honeysuckle or palmette design is a common one in tiaras. 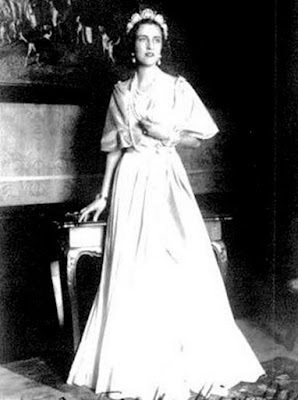 It can be used as an accent, as it is in the Bedford/Tavistock Amethyst Tiara, or as a main motif, such as the stylized example of the Medinaceli Art Deco Tiara and the more basic examples found in the Gloucester Honeysuckle Tiara and Princess Chichibu’s Honeysuckle Tiara. This particular version, belonging to the princely family of Liechtenstein, stands out as one of the purest adaptations of the popular design. The Kinsky Honeysuckle Tiara is made of diamonds set in gold and silver. It can also be used as a necklace. According to family tradition, the diadem was given by Ferdinand Bonaventura, 7th Prince Kinsky of Wchinitz and Tettau, to his wife, Princess Marie of Liechtenstein, around 1870. Princess Marie first wore the Kinsky Honeysuckle Tiara in 1993, which may be the only time she’s worn it publicly. 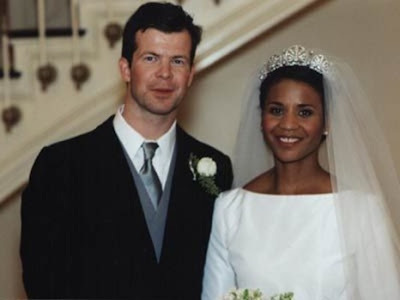 Her daughter, Princess Tatjana, chose the wear the tiara to marry Philipp von Lattorff in 1999 in Vaduz. Angela Brown wore the Honeysuckle Tiara when she married Marie and Hans-Adam’s son, Prince Maximilian, in 2000; the prince and his bride, who was born in Panama, held their religious ceremony in New York City. Another daughter-in-law, Hereditary Princess Sophie, has also worn the tiara on at least one occasion. Despite its use as a wedding tiara and its appearances on several family members, the Kinsky Honeysuckle Tiara remains a secondary piece in the Liechtenstein collection. The large Habsburg Fringe Tiara is the usual pick for international tiara events and they rarely wear tiaras for events at home; the past several years have seen Hereditary Princess Sophie wear the fringe in Sweden, Monaco, and the Netherlands. The princely family’s tiara collection is small, but with tiara events so few and far between, it all basically evens out. Which would you pick: Habsburg Fringe or Kinsky Honeysuckle?